When we got to Srinagar from Pahalgam on the evening of the 17th, we thought that if the situation had improved in the city we would spend an additional day there just to see the Hazratbal mosque, which we had missed out on earlier. However, there was no such luck. We were told that since the following day was a Friday more trouble could be expected. Madhu and I realized that there was no point in wasting any more time and decided to take off to Sonamarg, which is at the eastern end of the valley. That would be our last destination in Kashmir and from there we would head to the Ladakh region of J&K. So on the morning of the 18th, which also happened to be Madhu’s birthday, we sadly bid adieu to Srinagar and boarded a Sonamarg-bound JKSRTC bus. After the customary 20-minute mid-way halt at a shopping area, the bus dropped us off at Sonamarg at around 1pm. As it rolled into the main market area, what struck us immediately was the fantastic scenery! There were rolling hills of green meadows on either side of the road and these were framed by tall, snow-capped mountains; it was unbelievably picturesque! 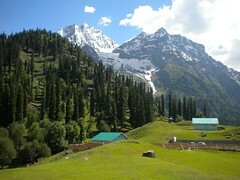 Each place we’ve visited in Kashmir has seemed prettier than the last one; it’s amazing! 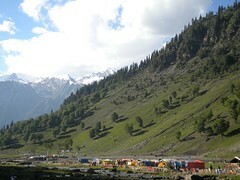 The market of Sonamarg is just a kilometer long string of stores and tiny eateries. We walked to JK Tourism’s Alpine Resort hotel, which is right in the center. At the hotel’s reception desk we were given the option to either stay there or in another property called Alpine Hut, which is located about 4kms away in the surrounding valley. Madhu had read or heard that the latter was located in a much nicer area than the market, so we opted for that. After lunch at a small eatery where we had the best Rogan Gosht ever, we took a cab to Alpine Hut. Just as expected is set beautifully in the center of grassy meadows with perfect views of the surrounding peaks; we were thrilled! We lazed the afternoon away and then at around 4pm, set out to explore the area. 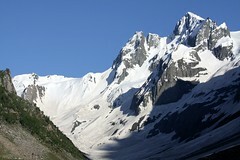 Sonamarg’s biggest attraction for most Indian tourists from the plains is the Thajiwas Glacier. Its snow has spilled down to the base of the mountains allowing visitors to walk and play in it without having to go up to the peaks, like at Gulmarg. From the market, a tarred road of about 8kms leads to the glacier, giving the local horsemen a little bit of business from visitors not inclined to walk the distance. Our hotel is about mid-way between the market and the glacier, so we opted to walk. We followed the horses ahead of us. They led us across hilly, grassy meadows, on to the tarred road and then up a short, rocky slope to a dirt track, which eventually took us to a string of tea-stalls; the snow glacier formed the perfect backdrop to them. As we passed the tea stalls, we kept getting asked to sign up for a ride on snow-sledges. We had seen these in action at Gulmarg and had had real safety concerns regarding them, especially at that height. 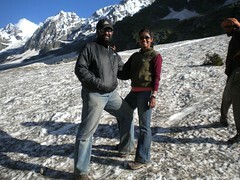 But out here, since the snow wasn’t all that high up, Madhu felt inclined to give it a try. At first we were quoted Rs.500 per sledge but since it was almost the end of their business day, we were able to bargain with the vendors and bring it down to Rs.600 for two. The vendors called upon two more men as ‘helpers’ for the ride and then we were led across the rocky, muddy base of the glacier towards the slopes. At first the men asked us to sit on the sledges. Then one of them pulled it from the front with the help of a rope while the helper pushed it from behind. The plan was to pull us all the way to the top of the slope and then slide back down. But the pulling was excruciatingly slow and painful for the men as they huffed and puffed their way up. After a few minutes, Madhu and I couldn’t watch this anymore and decided to walk up instead. Even though the men tried to persuade us to keep sitting, we could see the relief on their faces. But walking on a steep, snowy slope is not an easy task, so the men held us and ensured that there were no mishaps. At the top, they took pictures of us, all part of their service. Then after a few minutes of sitting around and enjoying the breathtaking scenery, we got down to the business end of the deal – sliding down to the base on the sledges. Madhu went first followed by my screaming self. Of course, we didn’t slide by ourselves; it was a tandem ride with the sledge owners. It lasted for just about a minute but was both scary as well as absolutely thrilling and loads of fun! Madhu, my birthday boy, was grinning from ear to ear when my sledge came crashing to a halt next to his at the base. By the time we stopped at the tea stalls for a break, it was 6pm and most of the day-trippers had left; we had the lovely landscape all to ourselves. We pulled up a couple of plastic chairs and sipped on hot tea in that fantastic setting. When we finally started our walk back to the hotel, we bumped into the sledge vendors again. One of them, who looked a lot like Bollywood’s Akshay Kumar, offered to take us on a half-day hike across the Thajiwas Glacier deep into the valley beyond. Apparently, a lot of foreign travelers do just that, some even crossing the mountains at the back and heading on to Pahalgam on foot. A shorter day-hike sounded great to us so we promised to meet him at 8am the following morning. Just before we got to the hotel, we saw a few men around a lone horse in the adjoining meadow. One of them looked like he was trying to train the horse. Intrigued, we went over and sat on a bordering wall watching them. The rest of the men walked over to us and we struck up a conversation. They confirmed that their friend was indeed trying to get the horse used to being ridden on. 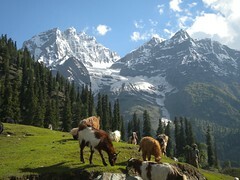 They claimed that the horse would be ready for rides to the Thajiwas Glacier within 3 to 4 days, provided the man is able to spend time with it every evening for a few hours. It was hard to imagine the bucking, wild horse before our eyes would soon me trotting tamely over the meadows lugging people on its back. Nevertheless, it was an interesting sight! Our first evening in Sonamarg ended gloriously with a moonlit night that made the surrounding snow-clad mountains glow! We were completely enamored by this place and couldn’t wait to see more!